Finding the right vacuum for the right job today is a tough task. There are many different vacuums with many different features and each manufacturer will tell you their machine is the best for this or the best for that. How do you sort out the good ones from the bad ones or pick the best vacuum for your cleaning needs? Ultimately you need to do a lot of research and analysis. At Vacuum Cleaner Advisor we’ve done that work for you and we have found the 5 best vacuum cleaners for your hardwood floors. When considering a vacuum cleaner for your hard flooring you will likely be considering a canister, an upright, or a stick vacuum. Each is different and has its pros and cons. Canisters are frequently the vacuum of choice when cleaning hardwood floors and other smooth surfaces. When cleaning bare floors you don’t really need a brushroll and many canister vacuums do not have one. When compared to an upright, a canister vacuum is often quieter and is more likely to have an auto retractable power cord. In addition, you also do not have to move the entire vacuum with each pass - just the hose/wand/cleaner-head assembly. This arrangement allows for easier reach under and around furniture (especially low furniture). Canister vacuums do, however, tend to have a narrower cleaning path, a shorter power cord, and smaller bags (if a bagged machine) than an upright. Upright vacuums are frequently the machine of choice for carpet as they usually have a motorized brushroll in the cleaner head. But some uprights are also quite capable on bare surfaces. 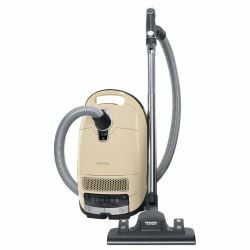 When compared to a canister vacuum the upright frequently has a longer power cord, a wider cleaning path, and larger bags (if a bagged vacuum). Uprights do tend to be louder however and they usually will not have an auto retractable power cord. In addition, you have to move the entire vacuum on each pass – and this generally requires a little more muscle. These are like a small upright. Some have powered brushrolls and some do not. 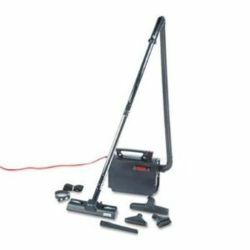 They are generally best for cleaning small homes or apartments and they usually do not have the power of a larger upright or canister vacuum. We do not recommend any in our list - but if you really like the convenience factor and only have a small area to clean, we do like the Dyson V8 Absolute with the soft brushroll floorhead (included). This unit is lightweight, fairly powerful and the special floorhead is designed not to mar delicate flooring. But it doesn’t come cheap and it is cordless and will run out of power after 20-40 minutes of cleaning (unlike a corded machine). The Alize is also our #1 choice for Best Bagged Vacuum and our top pick for the Best Canister Vacuum so it is no stranger to our best vacuum lists. This vacuum is loved by owners and owner's ratings give it an average score of 93 out of 100 which is exemplary. The Alize is fantastic at cleaning bare surfaces like hardwood, tile and vinyl but it is also capable on area rugs and some low pile carpet. It comes with the AirTeQ Combination Floorhead (model SBD 650-3) which does not have a brushroll but rather a rocker switch that allows one to use bristles for bare floor and brushes for carpet. The Floorhead also has a rubberized roller, and it glides easily across the floor ensuring no marring or scratching. 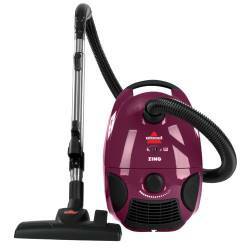 We see this vacuum online for about $650 and prices for this unit do not fluctuate much. You can read more in our Miele Alize Review. 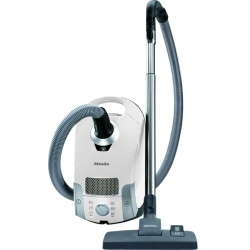 This vacuum is less than half the price of the Miele Alize and while it does not have all the bells and whistles it still delivers very good bare floor cleaning. This vacuum is a little more compact than the C3 Alize, the cleaning reach is a little shorter, and it does not come standard with HEPA filtration (although it is upgradeable). The floorhead provided is the AllTeQ Combination Floor Tool (model STB 285-3). It is best for bare surfaces. Product documentation states it is capable on low pile carpet and area rugs but many owners feel it is only adequate on these. The C1 Pure Suction does have strong suction (critical for good hardwood floor cleaning) as well as the ability to control the suction level. It is also very lightweight and quiet, and it has automatic power cord rewind. The Pure Suction carries a 7-year motor and casing warranty. We have seen pricing for this vacuum range from about $250 to $300. You can read more in our Miele C1 Pure Suction Review. This is a great choice if you like uprights. This unit is very good on bare floors AND carpet. It does have a brushroll however (actually it has 2) and they cannot be turned off. The brushrolls have speed settings so they can be set to turn slowly on bare surfaces. The main brushroll does have stiff bristles though so if you have very delicate flooring this vacuum may not be your best bet. But for more durable hard flooring it is a good choice. We have this vacuum and have tested it on bare floors, carpet and pet hair. It performs admirably on all. It has something called DuoClean Technology which uses very soft felt-like brushroll at the front of the cleaner head and a more typically stiff bristled brushroll in the center of the cleaner head. Both brushrolls are always spinning. The soft brushroll is great and picking up large debris and feeding it to the main brushroll and the soft brushroll also helps to remove stuck-on dust from bare floors. This vacuum is about the same price point as the Miele C1 Pure Suction. 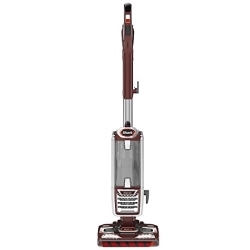 The NV801 is a bagless vacuum with HEPA filtration and sealed system design. All filters (both pre-motor and post motor) are washable. It also has a long power cord and it carries a lengthy 7-year warranty. Prices for this vacuum are typically between $300 and $330. You can read more in our comprehensive Shark NV801 Review. The Hoover CH30000 is sometimes referred to as the Hoover Commercial Portapower. This machine has also appeared in several of our best vacuum lists including best canister vacuum, best bagged vacuum and best vacuum cleaners under $200. The PortaPower is a small canister vacuum that has been on the market for some time. We first reviewed this machine back in 2010 and its market longevity is testament to its popularity. It has excellent cleaning reach with a 33 foot power cord and the no-brushroll floorhead is effective on bare floors. This is a small vacuum but it produces very strong suction for its size. The PortaPower is a little unique as the main body of the vacuum is designed to be worn over the shoulder. The vacuum comes with a shoulder strap. Fortunately the main body is not too heavy at 8.3 lbs. This is also a bagged vacuum cleaner but it comes with a reusable 3-layer cloth bag. Most bagged machines today do not have a reusable bag. If that wasn’t different enough the CH30000 also doubles as a blower. The vacuum carries a one-year warranty and is usually found for between $110 and $150. You can read the Hoover PortaPower review if you like. This bagged canister vacuum is very affordable and you should be able to find it for as low as $50 USD. At this price point you wouldn’t expect a lot of bells and whistles and indeed this vacuum has few. It is a small, compact vacuum however and it performs fairly well on bare floors like hardwood. The floorhead is not powered in any way and it has no brushroll allowing it to clean smooth surfaces well but limiting its capabilities on carpet. The machine’s compact size make it a good fit for a smaller home or apartment. The 4122 is so lightweight it is easy to carry in one hand. The power cord is on the short side but the unit has variable suction controls (not something you usually see on a machine this size) and an auto retractable power cord. It carries a 1-year limited manufacturer’s warranty. 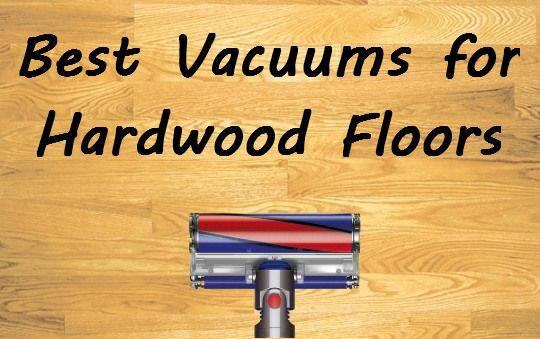 If you have a home with mostly hardwood floors (or other types of smooth flooring) and you are on a budget, you may want to look into this vacuum in more detail. You should be able to find this vacuum online for about $50 or $60. See our Bissell Zing 4122 review. If you are a fan of bagless units there is also a Bissell Zing bagless vacuum. Consumer ratings and pricing are similar for both the bagged and bagless units.